Cupcakes: those yummy, tiny little personal-sized cakes that are, without a doubt, the most popular sweet in the world. How do I know this? I know this because there are no fewer than 16 cupcakes shops in downtown Toronto alone (and those are just the ones I know about). I also know this because of an event I attended today; an event that was all about cupcakes, sold all 150 tickets, and had more than 40 volunteer bakers. The event? CupcakeCampToronto! 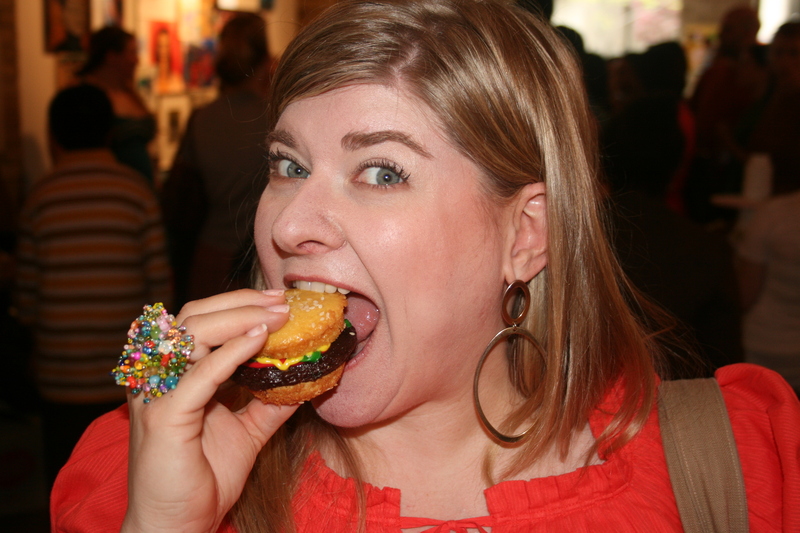 Born in San Francisco, the second annual CupcakeCamp Toronto was held today at a way cool space called 52 McCaul. The gallery was amazing — open, bright, and full of wicked original street and contemporary art. While the space was fantastic, the word “fantastic” doesn’t even begin to describe the cupcakes. 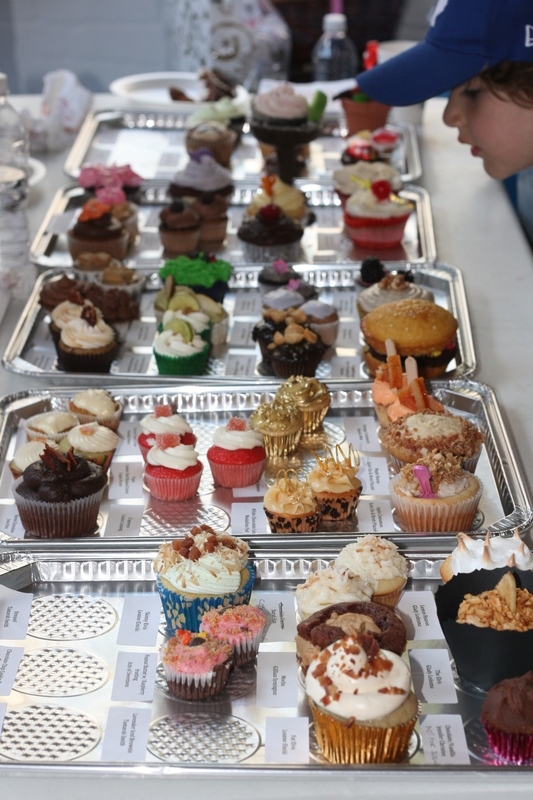 For a mere $10 donation, part of which went to the Daily Bread Food Bank, more than 2,200 cupcakes were brought by bakers from across southern Ontario. The cupcakes were in every imaginable shape and size. There were mini cupcakes, regular-sized cupcakes, cupcakes in chocolate “glasses”, cupcakes in flower pots, and every conceivable flavour: half baked (part cookie dough, part cupcake), blue curacao, strawberry daiquiri, “cheeseburger”, lemon curd, monks tea*, s’mores, blood orange with olive oil, and about 30 other delicious flavours. There were even cupcakes with bacon and Spam** sprinkled on top! Starbucks donated coffee, and bottles of water — an absolute requirement — were only $1 (proceeds which also went to the DBFB). My personal favourites were the lemon rhubarb red velvet and orange dreamsicle cupcakes. I reeeally wanted to try the s’mores cupcake, but by the time they came around in group nine of eleven (! ), I may or may not have hit the proverbial wall and gone into the proverbial sugar coma. Seriously — I never thought I’d see a day where I’d eat too much sugar, but today was that day. I started to feel weird, left early and, by the time I got home, my head was pounding. I was on a serious sugar high! I just wish there had been doggie bags because, even though I practically OD’d on sugar this afternoon, a key lime cupcake sure does sound good right about now! Check out my Flickr set from CupcakeCamp Toronto here. As some of you^ may know, Fall is upon us. Fall happens to be my favourite season of the year, for several reasons: trees that begin turning hues of bright orange, yellow and red; weather that begins to cool down*; days that begin to shorten**; and, since my birthday is close to Christmas, the beginning of Fall means I’m closer to finally getting some presents! 🙂 Fall also means that I get to break out my stylish winter garb without risking a quick death from heat stroke, as would likely happen if you tried to pair cashmere and Ugg boots in the nearly year-round tropical climate that is Houston. Although some of you may argue ;-), I personally believe I look far better in jeans, cashmere sweaters, and 4″ black leather boots than I do in Daisy Dukes, sleeveless tops and flip flops. A “summer body”, God did not give me. Fall is the time of year that, most importantly, marks the beginning of the winter food season and all of its deliciousness. Chilis, soups, stews, braised meats, paellas, and my personal favourite, risottos, are the hearty, “stick to your ribs” kinds of foods that make -30C weather bearable. That, and wearing seventy-two layers of Patagonia. Anyway. The overnight lows in Toronto last week hit 4C/37F, so I happily spent two hours making my first risotto of the season! It turned out fabulously, if I do say so myself’ and, as a matter of fact, my description of it on Facebook was apparently so appealing that it garnered scores of requests*** from far and wide to post it. Since my motto is “ask and you shall receive”, you can now enjoy the recipe**** for Shrimp, Asparagus and Dill Risotto! 1. Use a sauté pan other than the one you’ll use to cook the risotto. Cut off the asparagus tops and reserve. Snap off the woody ends from asparagus and discard. Cut the remaining stems into 1-inch pieces. Heat the oil and butter in a sauté pan. Add the stem pieces and cook five minutes. Add the garlic and the asparagus tips. Pour the water over the asparagus, season with salt and pepper (I also used Tony Cachere’s), and cook until tender, 5 to 15 minutes, depending on the asparagus. (If you like, you can add a sprig of rosemary to the dish with the garlic and tips, then remove it at the end). 1. Bring the stock to a simmer and set aside. Heat 2 tablespoons of the butter in a saucepan and cook the onion and shallot until soft, stirring with a wooden spoon. Add the rice and stir until translucent, about four minutes. Stir in the wine and reduce until almost dry. Add a ladle of stock and cook, stirring, until it disappears. Continue, one ladle at a time, until the rice is tender and creamy, about half an hour. 2. Stir the shrimp and asparagus into risotto, add the remaining tablespoon of butter, lemon zest, and cheese; cover and reduce heat to low; simmer, stirring once, for approximately ten minutes. Stir in dill. Spoon into bowls, serve, and enjoy!